The M-2 is a motorway in the Punjab province of Pakistan. It is 367 km long and connects Lahore with Islamabad. It passes through Kala Shah Kaku,Sheikhupura, Khanqah Dogran,Kot Sarwar, Pindi Bhattian, Salem, Lilla, Kot Momin, Kallar Kahar, Balksar, and Chakri before ending just outside the twin citiesRawalpindi and Islamabad. It then continues on to eventually become the M1 motorway linking the twin cities with Peshawar. The M-2 crosses the junction of the M3 (to Faisalabad) at Pindi Bhattian. 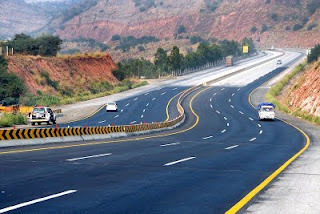 It is part of Pakistan's Motorway Network. The most interesting fact is that it can be used by Pakistan Air Force to land or take off many Fighter Jets. and turns north-west. It continues all the way to Kallar Kahar, where it enters the Salt Ranges. Once past the Salt Ranges, the M-2 turns north and ends just west of Rawalpindi at the junction between the Islamabad Link Road and the M1. The whole stretch of the M-2 consists of 6 lanes, and there are a number of rest areas along the route, with washroom and eating facilities. The M-2 was conceived by Prime Minister Nawaz Sharif in his first term(1990–1993) and later inaugurated on November 26, 1997, during his second term. In late 2006, upgrades were made to the portion of the M-2 passing through the Salt Ranges due to increasing complaints of drivers. The upgrades included better marking of the road lines and increased size of road signs for easy visibility.